Warning: The material in this kit is safe when using as directed. However, it contains chemicals that may be harmful if misused. 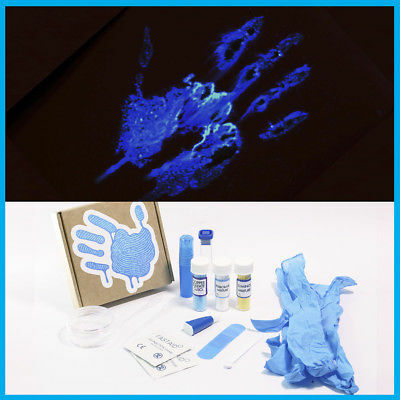 Therefore, we recommend this kit for hands-on use with children over 16 only, unless they are under the supervision of an adult to prevent any damage or injury. Remember safety first! Always use gloves when handling these chemicals and wear safety glasses if you have them. Also please carefully read these instructions before you start. The iodine clock reaction is one of the classic chemical reactions you are shown in school/university. Two colourless solutions are mixed together and, after a given amount of time, the solution suddenly turns dark blue – almost black. There are several variations of the clock reaction but this contains the iodate version. The chemistry is rather difficult as there are multiple reactions going on. The first is in one of the clear solutions where bisulfate (HSO3) is generated when sodium sulfite (Na2SO3) and citric acid (C6H8O7) are mixed together in water. When it is mixed with a solution of starch and an iodate ion (IO3−) source, it reacts to produce iodide (I−). If there is an excess of iodate (IO3) then it can oxidise the iodide (I−) (which was produced in the previous step) to form iodine (I2). This iodine (I2) is then immediately reduced back to iodide (I−) (the same stuff in the second step) when there is an excess of bisulphate (HSO3−). When the bisulphate runs out, there is nothing to reduce the iodine (I2) back to iodide (I−) or to react with the iodate, so the iodine builds up and can form triiodide (I3−) with iodide (I−). This then complexes with starch turning the solution black. Sodium sulfite, potassium iodate, citric acid, 2 x graduated test tubes, starch dropper, 0.05ml scoop, nitrile gloves (medium), pipet, and 1 x totally awesome MP button badge. The reaction requires that you first make up two different chemical solutions before mixing them together. In your kit there are two graduated test tubes with orange lids. These are where the reaction is going to take place. Take one and fill it with 3ml of water from the tap using the markings on the side. Don’t worry if you go over – simply use the pipette to get to the correct level. Add one scoop cup full of sodium sulfite (orange label) and one scoop of citric acid (red label) using the white scoop provided. Do not pile the chemicals on the scoop as this will change their ratios and might prevent the reaction from working. Take the second test tube and, as before, fill it with 3ml of water. Add one scoop cup full of potassium iodate (black label. This compound goes a little hard over time. Don’t worry the reaction will still work) and 3 drops of starch solution from the unmarked dropper. Put the orange lid back on and shake until contents are dissolved. This part has to be done quickly, so prepare yourself!!! Pour one of the contents in the test tube into the other and then back again. It does not matter which one you pour into which. Within a few seconds the solution should turn black suddenly. When you are finished, simply wash down the drain with excess water. The test tubes can be cleaned and reused again. You have enough chemicals in this kit to perform the reaction on a larger scale if you wish. Also you can try and extend the time of the reaction by changing the concentrations of the chemicals used (but always use 3 drops of starch solution). For example using one scoop of potassium iodate, two scoops of citric acid, and half a scoop of sodium sulphite will slow down the time for the solution to change colour. To dispose of your kit simply add all of the chemicals into approximately 1 pint of water. The bisulfite and iodate will be consumed and the iodine is complexed with starch so there is no oxidizer hazard. The solution can be then washed down the drain. The reaction produces little black beads that sank to the bottom of the test tube. This happens because the starch has came out of solution. To fix the problem drop the eye dropper (with the lid on) in boiling water and then allow to cool. The reaction did not work. If you follow the instructions the most likely reason the reaction is not appearing to work is that you have used an inadequate amount of potassium iodate. Try increasing the amount and see what happens. The reaction is going to fast. The time taken for the solution to turn black using the above instructions is about 1 second. This can be changed by using different amounts of the chemicals provided but using the same amount of the starch solution. The potassium iodate solution turned black before I added it to the sodium sulfite solution. This is most likely down to the test tubes not being cleaned adequately from the previous reaction. Potassium Iodate: Contact with combustible material may cause fire. Harmful if swallowed. May cause sensitization by inhalation and skin contact. Keep/Store away from clothing/ combustible materials. If experiencing respiratory symptoms: Call a POISON CENTER or doctor/ physician. In case of accident or if you feel unwell, seek medical advice immediately. Sodium Sulphite: Not a hazardous substance. Contact with acids liberates toxic gas.